Pig and Hen play a game of hide-and-seek. Pig counts to ten while Hen goes off to hide. Where could Hen be? Pig sees a long yellow beak behind the gate. Could that be Hen? Lift the flap to find out and join pig and many other woodland creatures in the search for Hen. 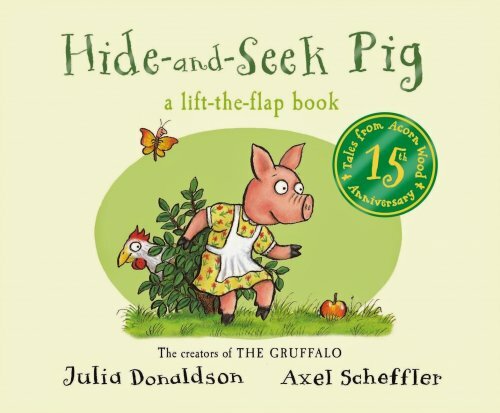 Hide-and-Seek Pig is a fun picture book with sturdy lift-the-flap pages which are guaranteed to keep young children engaged as they try to find Hen in various locations. On each page, we can see parts of animals peeking out from behind the flap, allowing children to identify parts of objects as well as predict who might be behind the flap. Children can also listen to descriptive clues that go along with each hidden animal to figure out who it might be. For example, can you see a long brown ear? Can you see a furry tail? For further speech and language targets in Hide-and-Seek Pig, see the list below.